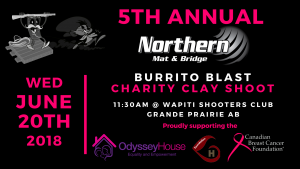 Northern Mat and Bridge is excited to announce details for our 5th Annual Charity Shoot! This years theme is, Burrito Blast! 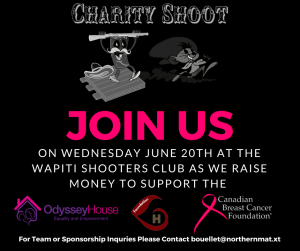 On Wednesday June 20th, at the Wapiti Shooters Club in Grande Prairie, Alberta we raise money thanks to the incredible support of our partners for local charities in our community. This year, we’re thrilled to support the Grande Prairie Odyssey House, The Canadian Breast Cancer Foundation, and the Grande Prairie Regional Hospital Foundation! All proceeds raised through the Northern Mat and Bridge’s Charity Shoot will provide care to those in need. If you’re interested in attending the Charity Shoot as either an individual shooter, team, donation of auction items or sponsorship send an email to bouellet@northernmat.ca. We look forward to having you join us and help make a difference in our community!